I took my daughter to see Alvin and the Chipmunks: The Squeakquel back when it was first released in the theater. She loved it, especially because it featured the Chipettes. 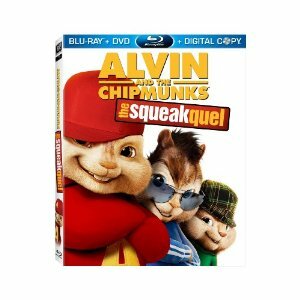 For me, it Alvin and the Chipmunks: The Squeakquel reminded me of the Saturday morning cartoon series from the 80's so it was a nice slice of nostalgia. And I was happy because it was a very family friendly film. After the film, I told her about how I used to get up every morning to watch the TV show and we even tried to pitch shift our own voice so we could sound like The Chipmunks. The movie recently came out on DVD so you can go out and buy it now. It would be a great addition to your home DVD collection. There's also a pretty cool deal available if you buy the Double DVD Pack. It comes with "The Squeak Along" Bonus Disc which has more music, more mayhem and some all-new singalongs! For some added fun, make sure you head over to http://www.munkyourself.com and see what you'd look like as one of The Chipmunks. My daughter and I had a lot of fun with this. What are you waiting for? Go MUNK yourself! If you're still looking for More Munk Mayhem, then make sure you visit http://www.foxfamilyflicks.com. lmao.. too funny!! love it!